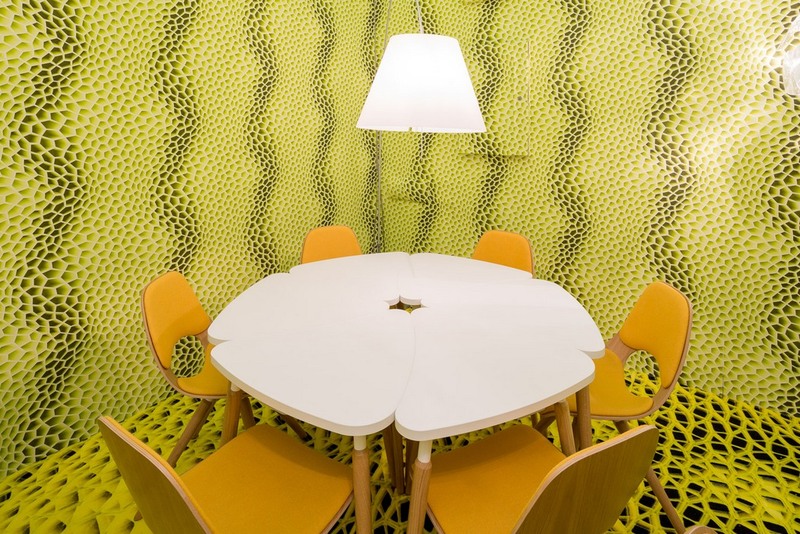 Back by popular demand, once again this year, Mac Stopa brings his stylistic approach to the press office of Interni. 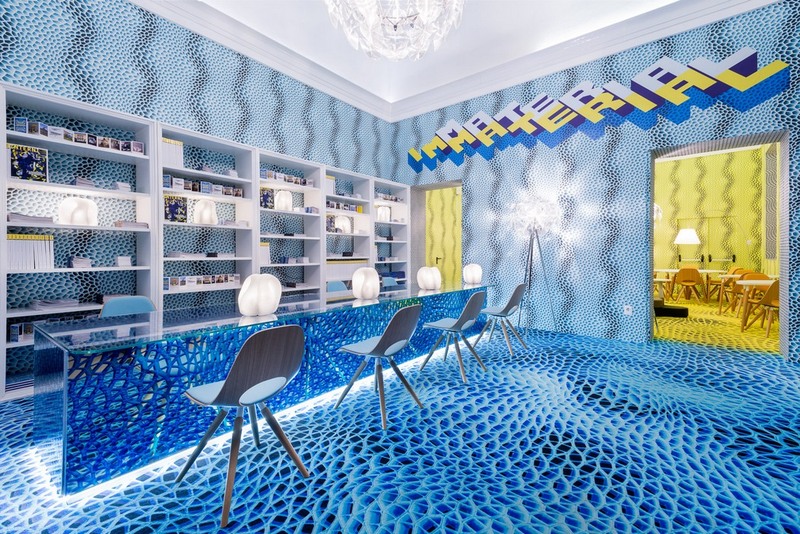 In the Immaterial Dream Interni Press Office installation, Mac creates a futuristic dream world that springs from organic, three-dimensional and modular forms, experimenting with new materials and finishes applied to walls, floors and furniture. 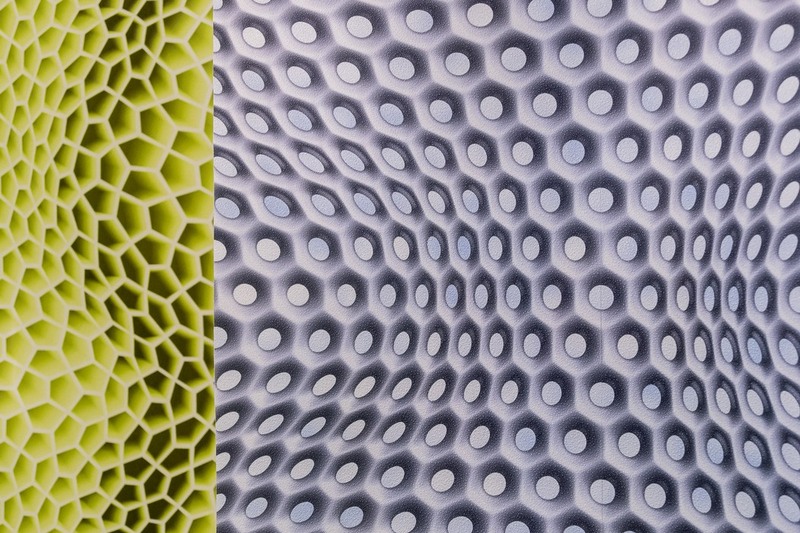 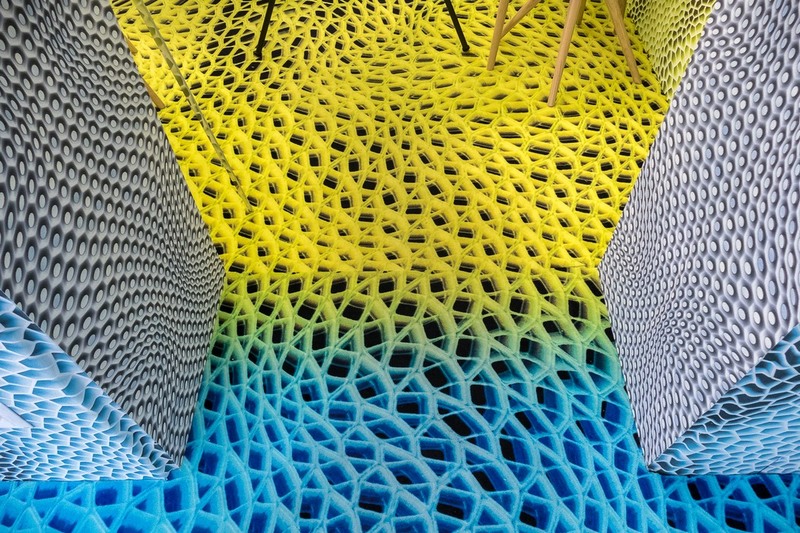 The installation features interior design using digital technology, creating a world of futuristic 3D geometries and patterns, furniture and finishes, some whose surfaces dematerialize. 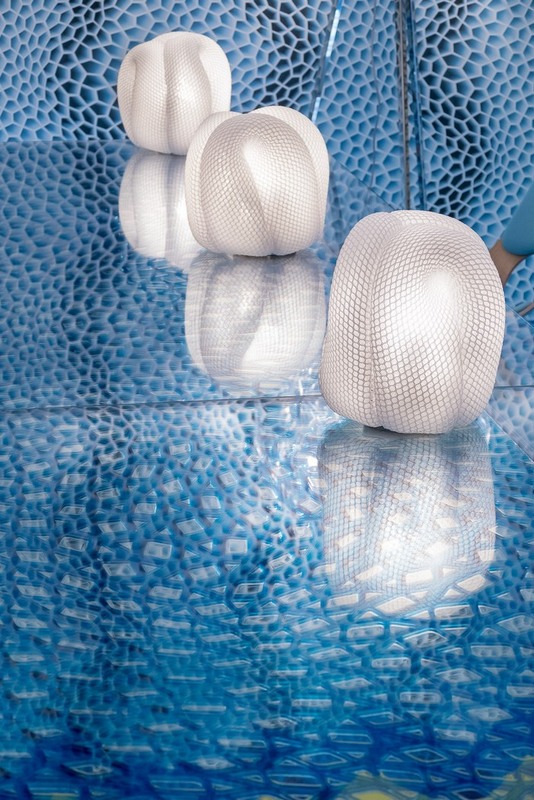 Some interior elements are custom designed by Mac Stopa, while others he designed for serial production and integrated them into the design of the installation. 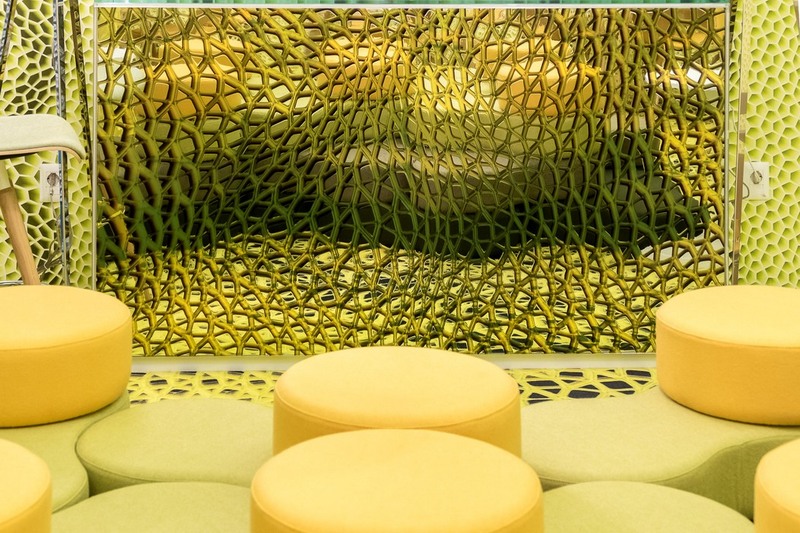 In the design of the press office, Mac expresses his interpretation of the theme of the Material-Immaterial Interni exhibition by creating a virtual and immaterial dimension and challenging the physical perception of the space. 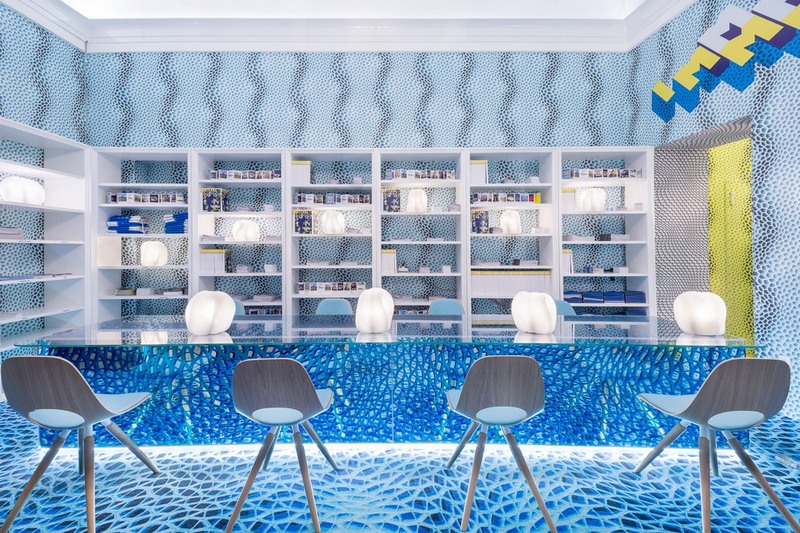 His design of the press office uses digital technology to create and manufacture new types of wall covering, carpet, reception desk, modular furniture, coffee bar and lamps, creating interiors with movement, deep textures and bold vibrant colors. 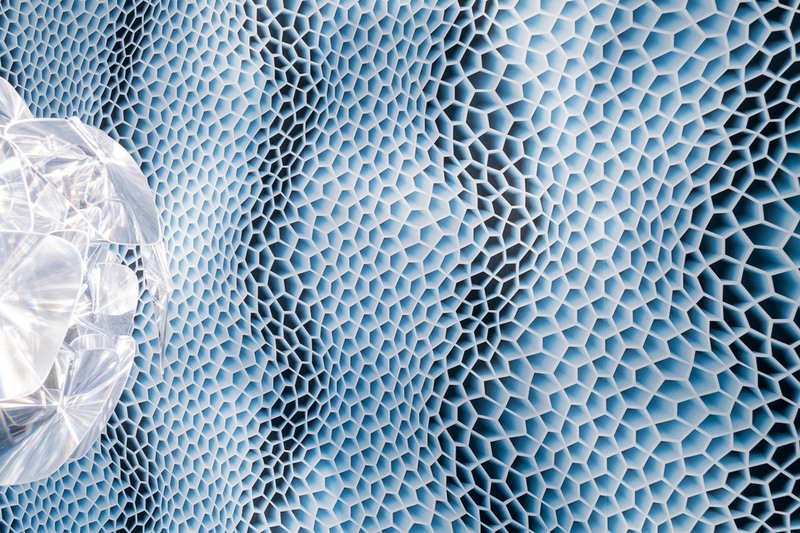 By applying his 3D patterns on different materials and using different production technologies, combined with new geometries of his modular furniture, Mac brings visitors into a dream world of immaterial virtual reality. 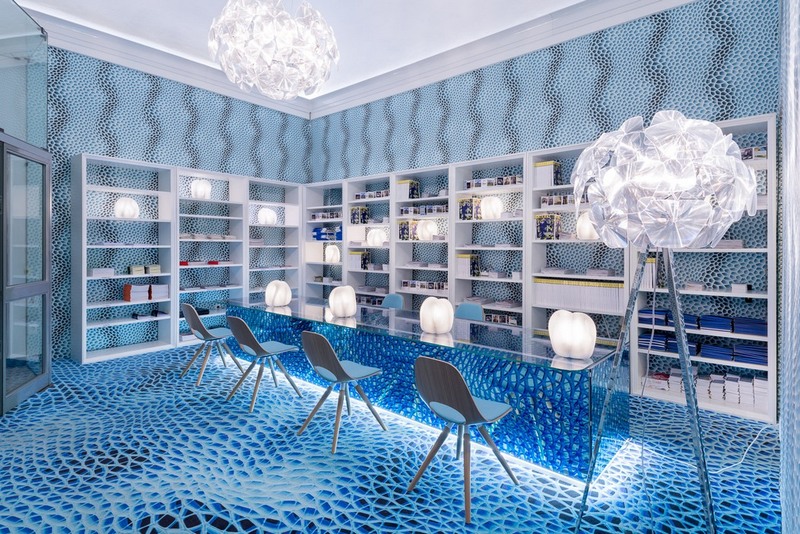 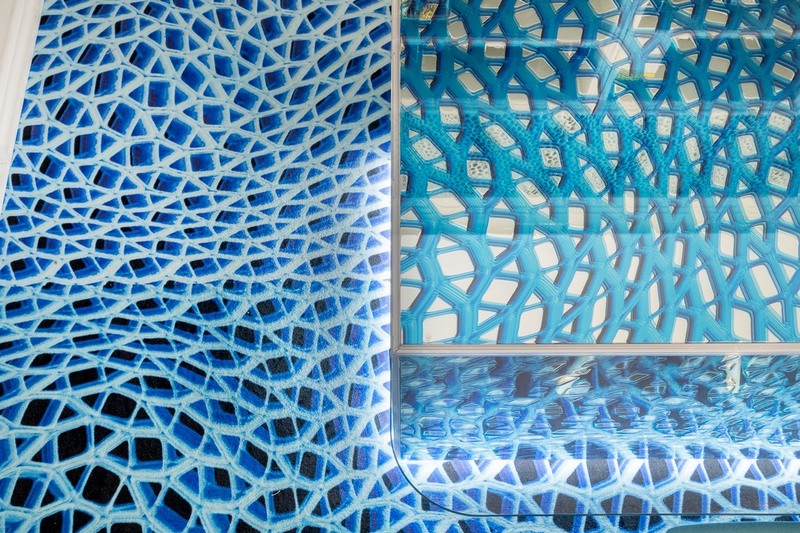 Visitors to the press office are greeted in the blue room’s reception area at the reception desk made from mirrored glass with Mac’s Immaterial Dream 3D translucent mesh pattern, whose surface appears to dematerialize. 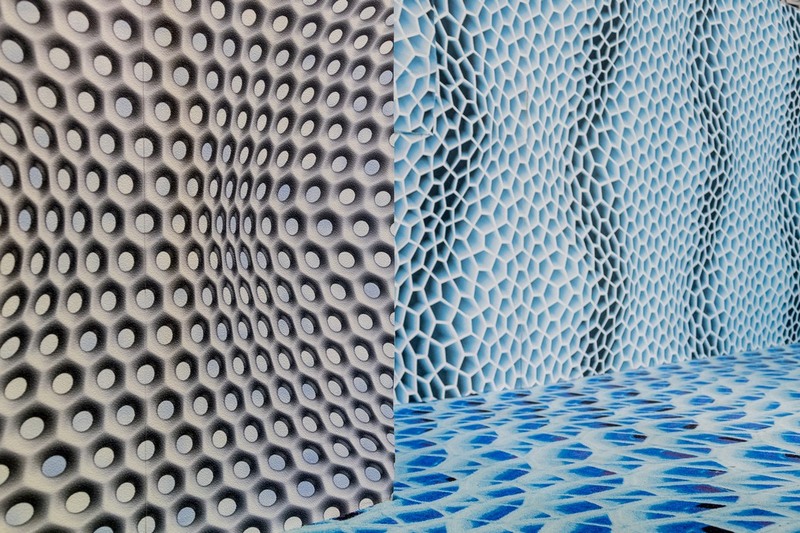 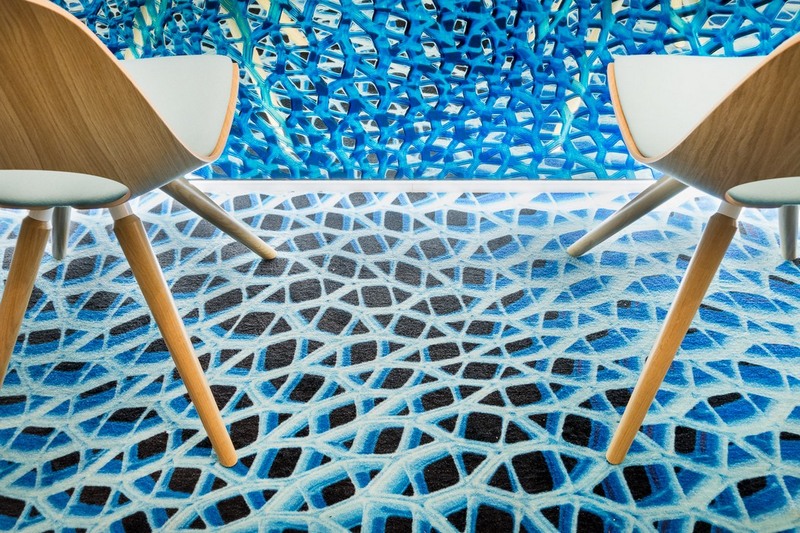 The blue walls appear to be moving, an optical illusion created by the 3D tessellating pentagonal pattern on the wallpaper, one of several patterns in the Harmony in Motion wallpaper collection designed by Mac Stopa for A.S. 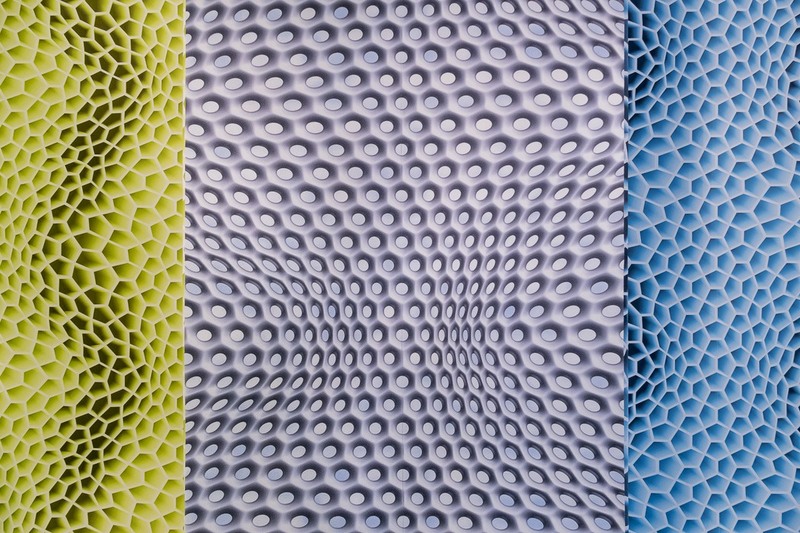 Creation. 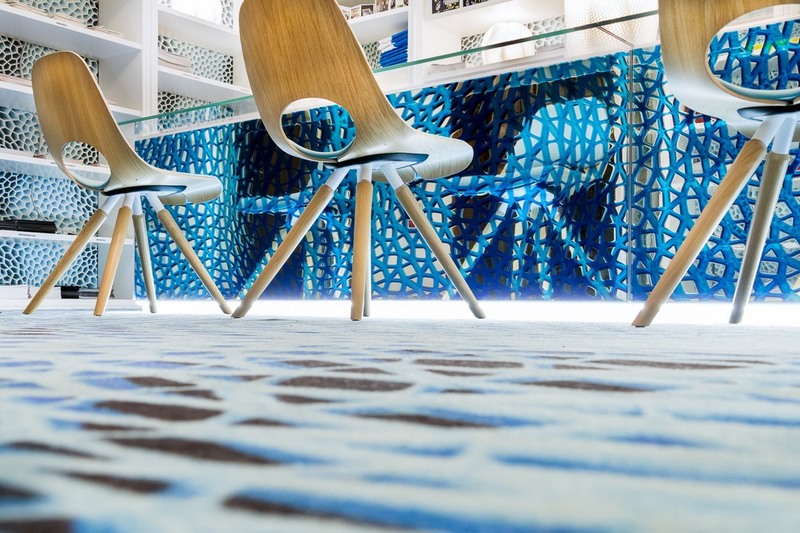 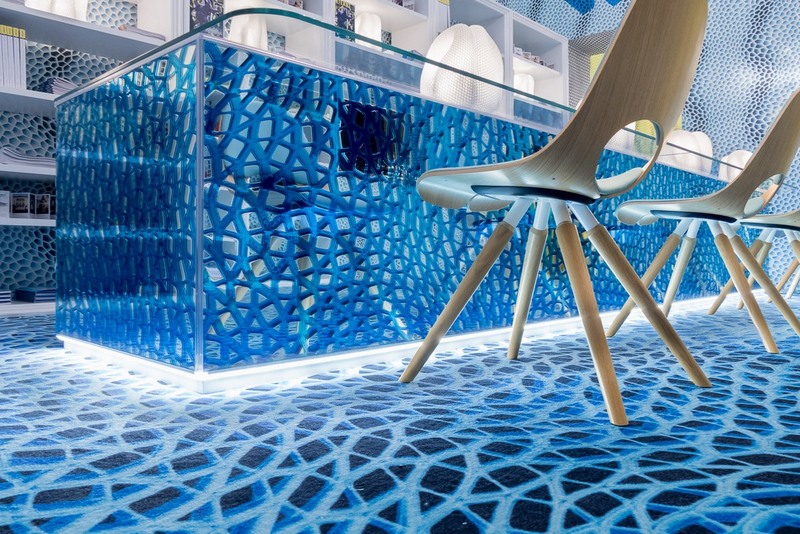 Mac’s Immaterial Dream carpet pattern in blue color produced by M2 Carpets becomes a blend of colors before changing into yellow in the adjoining room, creating three-dimensional flooring resembling stretched polycarbonate mesh. 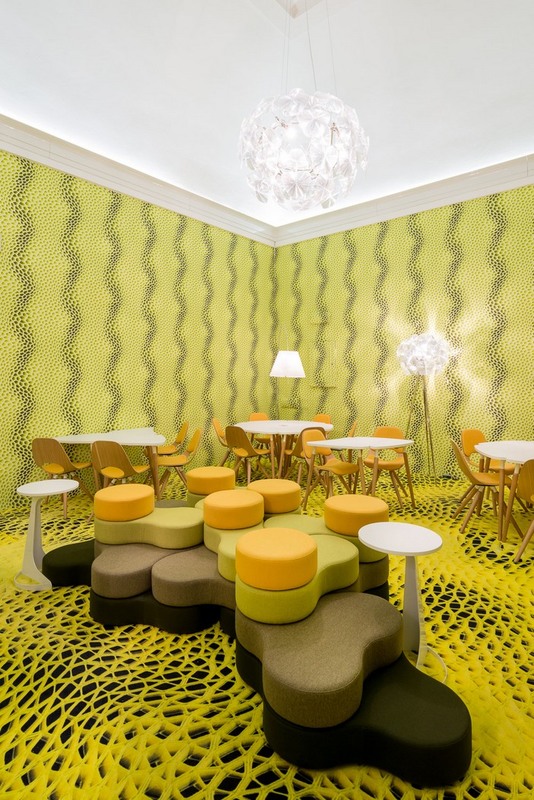 The yellow room is designated for work and integration. 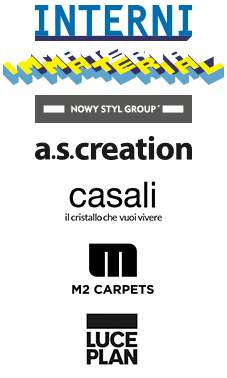 The entire space is furnished with Tauko chairs, Tauko modular tables and award-winning Tapa poufs, all designed by Mac Stopa for Nowy Styl Group. 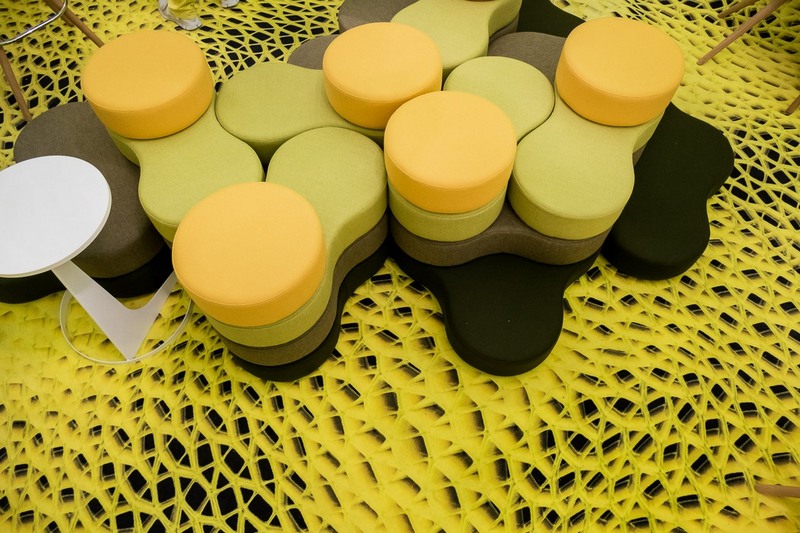 The tables and poufs are based on modularity and tessellating geometries, allowing users to change their functional layout on an as-needed basis. 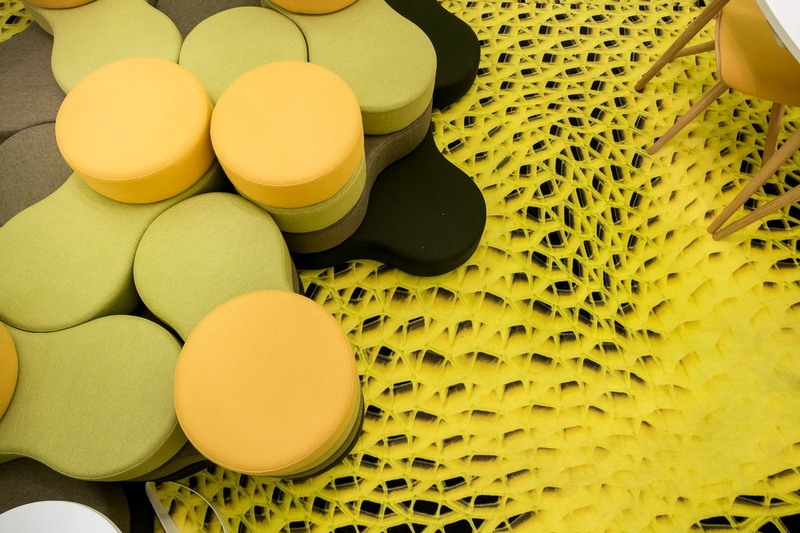 The Tapa pouf, winner of an ICONIC AWARD: Interior Innovation Best of Best 2017 for seating in the “Office and Workplace” category, is a modern solution for use in relaxation areas in offices as well as in public spaces. 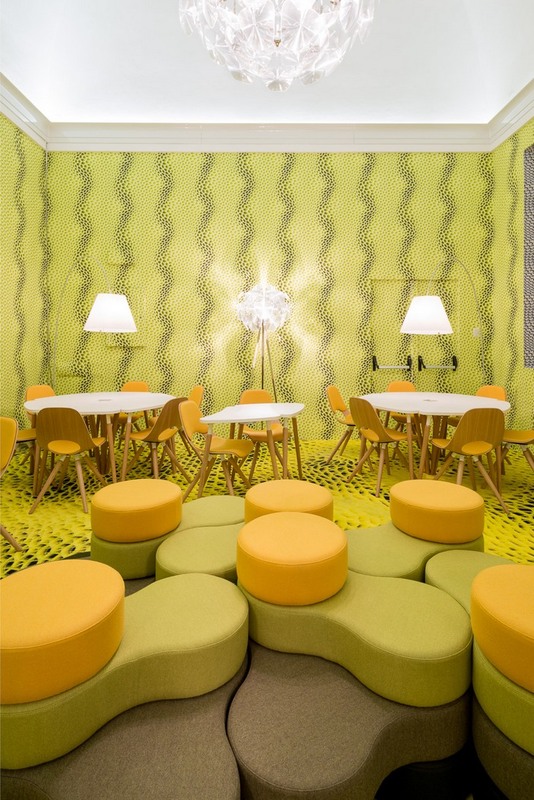 On the walls in the yellow room, there is a mix of 3D patterns from the Harmony in Motion collection including the pentagonal pattern in yellow color and a three-dimensional circular pattern in white color that covers the door and window frames, adding more movement and deep textures to the interiors. 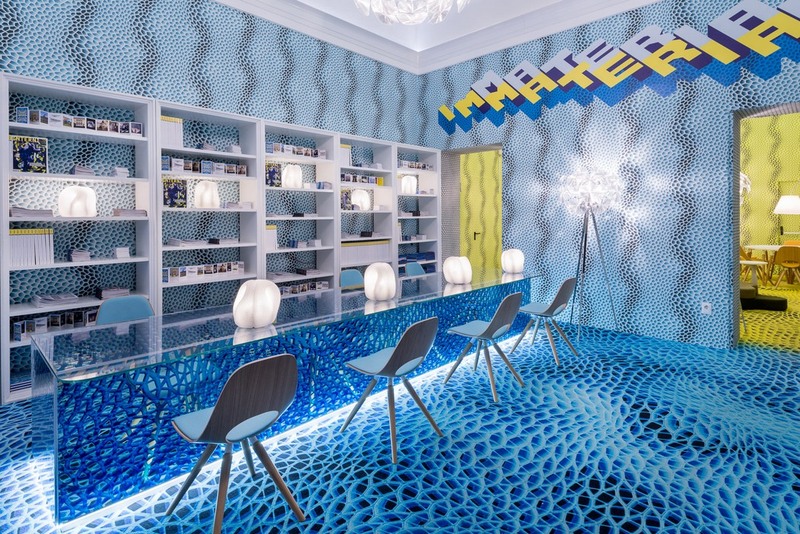 The coffee bar in mirrored glass with a yellow translucent mesh pattern and the blue reception desk, both produced by Italian glass manufacturer Casali, create an amazing virtual reality effect of 3D mesh floating in the mirrored background. 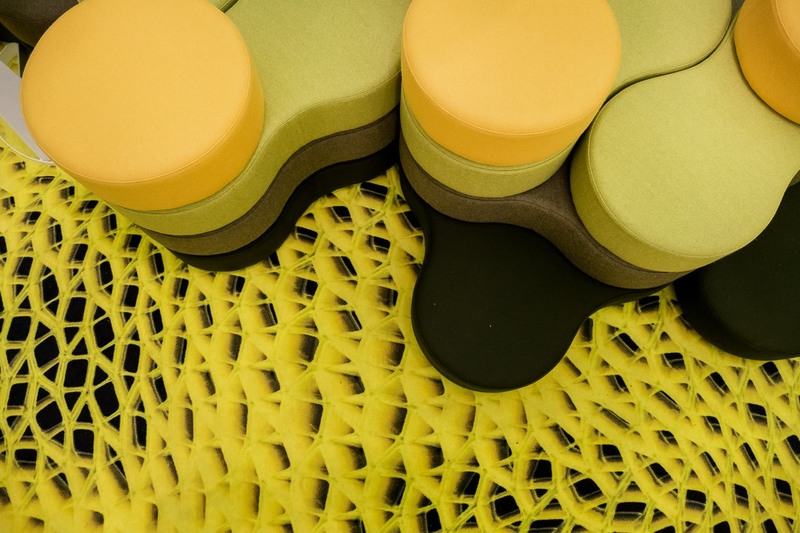 The Tauko bar stools are also designed by Mac Stopa for Nowy Styl Group. 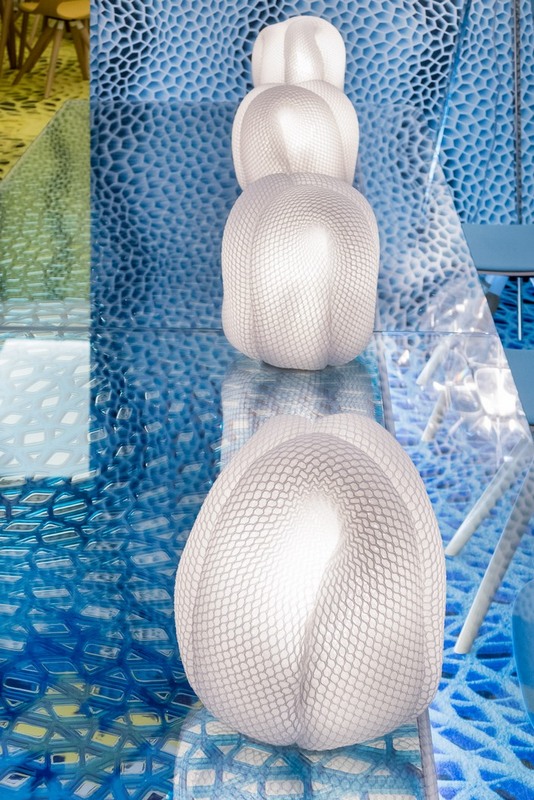 The press office is beautifully illuminated with Luceplan’s Hope chandelier and floor lighting and Lady Constanza lamps, as well as Immaterial Dream lamps with an organic shape and futuristic vibe designed by Mac Stopa.